The Mission to Seafarers is a non-profit worldwide charity operating in many shipping ports, including Halifax. The mission provides a safe meeting space, interdenominational religious services and counselling services to crew members that are often thousands of miles from home. In December, the Maritime Museum of the Atlantic partners with the Mission to Seafarers to deliver care packages to mariners staying aboard ships during the holidays. 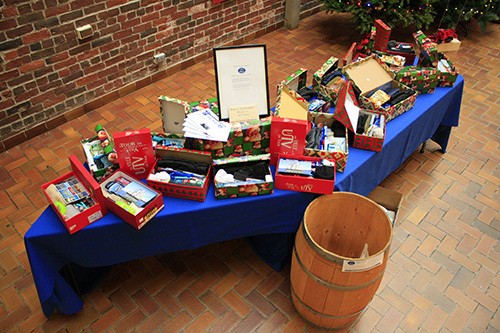 Shoeboxes are filled with essential supplies for their time in chilly Canada and at sea. A special thank you to the management and staff of John David Shoes for their donation of this year’s shoeboxes.